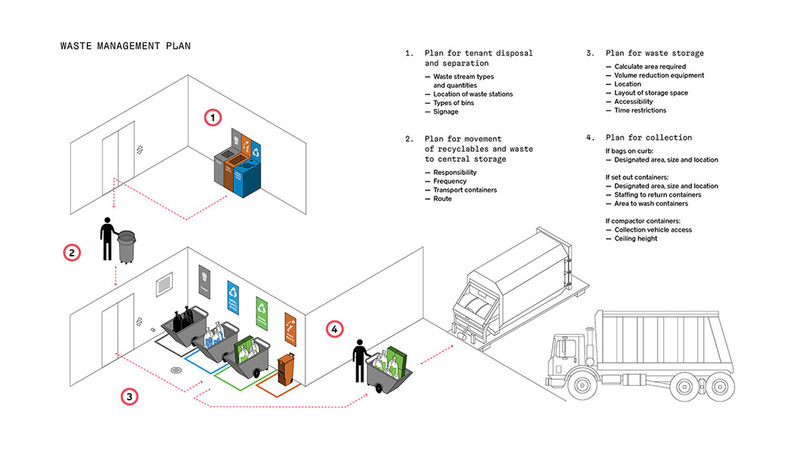 Could architects help solve New York’s big, stinky trash crisis? As more than 25,000 architects convene in New York City this week for the annual AIA Conference and Expo—the largest architecture convention in the U.S., hosted by a different region each year—the city’s local AIA New York chapter (AIANY) and its Center for Architecture has chosen to place a somewhat unconventional design topic right under their noses: trash. New York City carts away 13,000 tons of it each day from homes and public buildings, making waste management a billion-dollar industry each year. More than 80% of that trash ends up in the landfill, well over a third of which is compostable organic waste. With its current exhibition, Designing Waste: Strategies for a Zero Waste City (through Sept. 1), AIANY hopes to light a fire under architects by calling out those dismal diversion rates as a design problem—one to be dealt with, most crucially, at the individual building scale, where architects hold the most agency to bring about direct, critical improvements before waste even makes it to the street and to the sorting facilities. That ubiquity equates to a series of design challenges that can be daunting to navigate in a dense, multilayered city like New York. Recyclables are lazily and inefficiently sorted and diverted. Posters and signage can often be incoherent and inconsistent at best, confusing even the well-meaning environmentalist; and there are several building types to consider, each of which contains its own internal waste management system. Take, for example, an average, three-unit Brooklyn brownstone: Residents simply walk down waste to shared designated bins on the street each week, leaving sorting up to the individual. In larger buildings with dedicated staff, residents can throw waste down a chute on each floor. But building code dictates that recycling must be kept separately from the chute, leaving a wide discrepancy of convenience that rewards a lack of effort. And many of the public housing buildings administered by NYC’s Housing Authority, Blum says, only recently implemented recycling programs a few years ago. By analyzing a number of different typologies, systems, and the pros and cons of each, the show aims to embolden architects to design around waste in order to implement a more circular outcome. Some problems simply come down to arithmetic: Addressing the fact that allocated space for collecting and organizing waste in a given building is often improperly accounted for, leading to overflow and increased litter, Blum has installed a kiosk of interactive “waste calculators” to emphasize how physical space can crucially improve efficiencies. “It’s about making architects recognize how much space waste takes up, and making you see what you usually ignore,” said Blum. 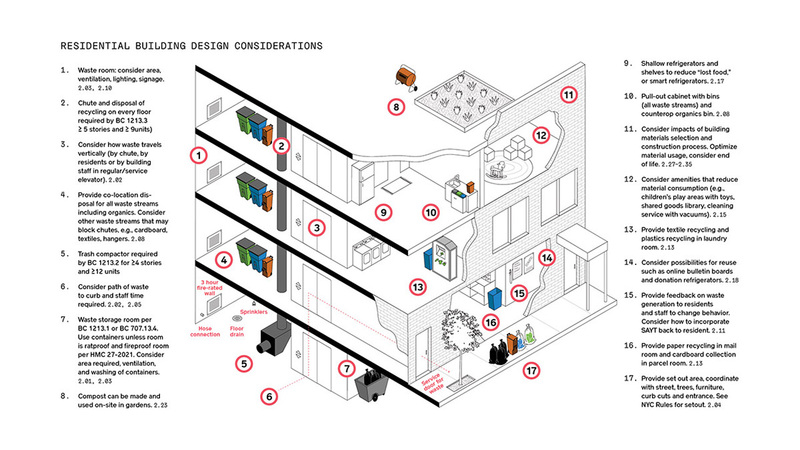 The show was organized as a component to the Zero Waste Design Guidelines, a comprehensive, 269-page report that AIANY published last October, with funding from the Rockefeller Foundation. With insights and recommendations that take stock of the New York’s existing conditions, the guide is an actionable follow-up to the city’s ambitious OneNYC plan, which assessed current waste problems and mandated the lofty goal of sending zero waste to landfills by 2030. In technical terms, the city specifies “zero waste” as a 90% reduction of waste-to-landfill refuse from its 2005 data set, which tallied a whopping 3.6 million tons of refuse that year. Adding to the complexities of that figure is the fact that the city only holds accurate data for residential waste, which is managed by its Department of Sanitation; commercial waste, on the other hand, is managed by individual businesses and contractors. Blum estimates that commercial buildings contribute to about half of the city’s total waste, adding that, while laws are tightening for this sector, it remains a murkier issue, due to fragmented data sets and a poor labor and safety record that the city cannot fully account for, as ProPublica reported earlier this year.